Sophomore defenseman Ryan Sullivan (Toronto, Ont.) was honored as the Top Scholar-Athlete in Hockey East for 2004-05. Sullivan led all league players with a 3.97 GPA. New Warrior head coach Mark Dennehy sat down for a chat with Mike Machnik of Warrior Radio during the Hockey Night in Boston Tournament in Chelmsford on Tuesday, August 2nd. To listen to the interview, click here or right-click to save the mp3 file to your computer. You can also subscribe to the new Warrior Hockey Podcast RSS feed which will run throughout the upcoming season with new interviews, news and more. The feed is available through the iTunes Music Store, the first ever NCAA hockey podcast available there. Click on the "Subscribe with iTunes" image above to launch iTunes and be taken directly to the iTMS, where you can subscribe and view other podcasts. 2003 graduate and former goaltender Joe Exter has been named as an assistant coach at American International College (Atlantic Hockey Association) in Springfield, Mass. "We are excited about having Joe on our staff," said AIC coach Gary Wright. "He is passionate about the game and his career objective is to be a hockey coach. Importantly, he has been a captain at every level, including at Merrimack, where he had a stellar career. Our expectation is that Joe will strengthen our hockey program." Exter played for the Warriors from 2000-03 and captained the team in his senior year while also being named to the All Hockey East Second Team. He played two seasons of pro hockey for the Wheeling Nailers of the ECHL with a career record of 18-15-2 and six shutouts. The 4th annual Merrimack Hockey Golf Tournament will be held on Thursday, September 8 at 1:00 p.m. in Danvers. For more information, call Paula McRobbie at 978-837-5385. A car accident in Rhode Island early in the morning of Saturday, June 18, claimed the life of Warrior hockey alum Cam DeYoung. Cam was only 23. He played 30 games over two seasons for Merrimack from 2001-03 and was from Bowmanville, Ontario and also played for the Walpole Stars of the EJHL and Choate Rosemary Hall in Connecticut. Please remember Cam and his family and friends in your thoughts and prayers. The notice from Cam's hometown paper in Canada reads: "DEYOUNG, Cameron Wesley - Tragically as the result of a motor vehicle collision at Warwick, Rhode Island on Saturday, June 18th, 2005, at age 23. Dearly beloved son of Sherry Keast and Terry DeYoung and brother of Michelle DeYoung. Sadly missed by his grandparents Tom and Helen DeYoung and Marion Copeland and the late John Copeland. Will be sadly missed by his special love Ami Newsham of Rhode Island and his best buddy Steve Puddister. Friends may call at OSHAWA FUNERAL SERVICE "Thornton Chapel", 847 King Street West (905-721-1234) for visitation on Thursday, June 23rd from 2-4 & 7-9 P.M. Funeral Service will be held in the Chapel on Friday, June 24th at 11:00 A.M. Cremation. Memorial Donations to the Canadian Cancer Society or Alzheimer Society would be appreciated." Merrimack sophomore defenseman Ryan Sullivan was named as the Top Scholar-Athlete in Hockey East for 2004-05 after recording a 3.97 GPA during the school year. It is the second highest GPA ever recorded by a league player and marked the third time in four years, sixth ever, that a Warrior received the honor. Sullivan was also named as one of six Academic All-Stars by position and was one of seven Warriors honored with a selection to the Hockey East All-Academic Team. Also named from Merrimack were sophomore defenseman Brian Boulay, junior defenseman Scott Drewicki, senior goaltender Casey Guenther, senior defenseman Peter Hams, junior forward Nick Pomponio, and junior defenseman Bryan Schmidt. The Warriors' seven honorees ranked third among the nine Hockey East schools. Merrimack head coach and interim athletic director Chris Serino resigned from both positions at the school, effective June 30. The announcement was made on April 29 by Merrimack President Richard J. Santagati. Serino, who directed the Warriors for seven seasons and served as interim athletic director for the last three, has accepted the position of coach and athletic director at Malden Catholic High School. He leaves Merrimack with a record of 78-149-27 following a 2004-05 season in which the Warriors failed to make the Hockey East playoffs for the first time in nine years. During his time at the school, Serino was instrumental in the renovations of the Lawler Arena at the Volpe Center, including a new locker room and training facilities, luxury boxes and Blue Line Club function room. Merrimack will begin a search immediately for both the positions of hockey coach and athletic director. Junior defenseman and co-captain Bryan Schmidt was named as Most Valuable Player for the 2004-05 season at Merrimack's annual banquet held on March 31. Senior forward and co-captain Steve Crusco received the Fans' Award and the Francis J. "Buzz" Miller Unsung Hero Award, while senior defenseman Peter Hams was honored with the Coaches' Award. Junior forward Matt Johnson was the Offensive Player of the Year, and sophomore defenseman Ryan Sullivan was the Defensive Player of the Year. 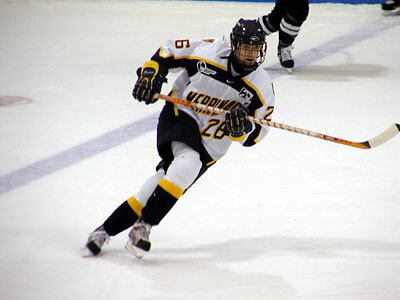 Freshman forward Jordan Fox was the team's Rookie of the Year. Also honored was Director of Physical Plant Robert Coppola, who received the Richard Britt Humanitarian Award. Junior defenseman and co-captain Bryan Schmidt was named to the Hockey East All-Star Team after a season in which he led Merrimack with 31 points on 13 goals and 18 assists. Schmidt was a second team honoree. Also a Hockey East All-Rookie Team member in 2003, Schmidt became the fifth Warrior ever named as a Hockey East All-Star and the first defenseman, joining goaltenders Martin Legault (1995, 1997) and Joe Exter (2003) and forwards Rejean Stringer (1999) and Anthony Aquino (2001). The awards are determined by a vote of the nine Hockey East head coaches at the conclusion of the regular season. 2004 graduate and first-year pro Marco Rosa was the runner-up as ECHL Rookie of the Year. Rosa finished second in the balloting of league coaches after recording 34-31--65 for Long Beach, good for second on the team. His 34 goals were the fourth most in the league, and he was also 16th on the ECHL scoring list. Rosa's efforts helped Long Beach to second place in the West Division, just three points out of first. Long Beach won its first round series against Idaho before falling in the division finals to first-place Alaska. Andy Heinze, a 1990 graduate, was named as the Coach of the Year in the Eastern Junior Hockey League (EJHL). It is the second time in six years that Heinze, the coach and GM of the EJHL's Valley Jr. Warriors, has received the honor. Heinze directed the Junior Warriors to a 31-17-3 record. At Merrimack, Heinze had totals of 77-89--166, good for tenth on the school's all-time scoring list, and still holds the record for the fastest hat trick in Hockey East playoff history. He is also a former assistant coach at Merrimack and captained the team in its first season as a member of Hockey East. 1998 graduate Marty Laroche coached the PRPC Ice Prowlers (28-8-0) to their third straight GCHSCHL title, finishing with their best league record yet. In three years, Laroche has coached PRPC to a record of 73-18-4. Laroche is also a volunteer with Ohio State, which finished second in the CCHA Tournament and earned another bid to the NCAA Division I Tournament. In his four years at Merrimack, Laroche finished with 128 points, 23rd on the all-time list. Merrimack hockey alum Casey Kesselring was chosen as the New Hampshire Division 1 High School Hockey Coach of the Year. Kesselring, a forward for Merrimack from 1994-98, directed Pinkerton Academy (Derry, N.H.) to an 18-6-0 record and its first-ever berth in the NH state semifinals, where the Astros fell to eventual champion Hanover. In four years at Merrimack, Kesselring recorded 133 points, good for 20th on the school's all-time scoring list. He went on to a pro career before retiring to coach Pinkerton. Merrimack hockey alumni Rob Atkinson, Mark Cornforth, Mark Goble and Cooper Naylor captured their second straight World Pond Hockey Championship on Feb. 20 in Plaster Rock, New Brunswick. The four, who comprise the Boston Danglers, played for the Warriors in the mid-1990s; three of the four went on to a pro career and now all live and work in the Boston area. The Danglers took first place in the tournament which featured 96 teams from all over the world. The tournament was featured in the "Leading Off" section of Sports Illustrated in its Feb. 28 issue. Update: The Milford (Mass.) Daily News had this article on May 2 about Atkinson and the tournament. Junior defenseman and co-captain Bryan Schmidt was named as a semifinalist for the prestigious Walter Brown Award, presented annually to the top American born Division I college player in New England. Schmidt leads Merrimack with 13 goals and 18 assists for 31 points. It was the second straight year that Schmidt was named as a semifinalist for the award. 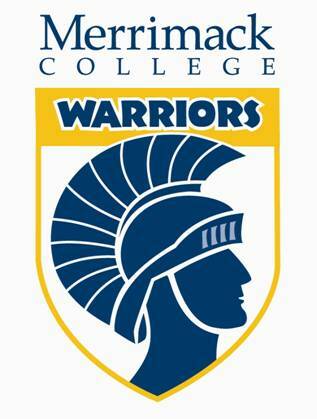 The Warrior Gift Shop at Sportdesigns.com is the place to go for all Merrimack and Hockey East merchandise. Replica jerseys, t-shirts, caps, sweatshirts, and more are all available. Visit the shop by clicking on the link above and then selecting "Merrimack" on the left hand side. A portion of all Merrimack and Hockey East merchandise purchases made through the Warrior Gift Shop goes to support warriorhockey.org.